We haven't met anyone yet who doesn’t like chocolate. We can eat it just to delight our senses or maybe to prevent cardiovascular diseases, as doctors recommend. Its soft texture, its variety of flavors (spicy, bitter, sweet, refreshing, exotic), its multitude of shapes and not to mention the solid history behind it—it all comes together to make chocolate the next indispensable ingredient after oxygen and water. If you are not convinced of its benefits yet, here is an example: why do you think people feel the need for "something sweet" – which is usually chocolate or chocolate ice cream - whenever they are depressed? Well, the answer is quite obvious: chocolate raises the brain's serotonin levels. Chocolate isn't always a comfort food, though. 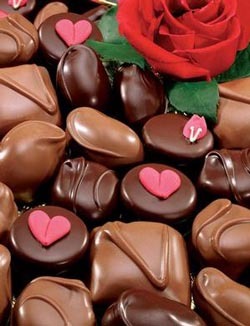 It is also traditionally a gift for your sweetheart or other people close to your heart on Valentine's Day. If your sweetheart happens to be on a diet, and you don't want to risk her wrath by giving her the real thing, perhaps a jigsaw puzzle Valentine is just the thing. You may find the Chocolate Sweethearts 350 pieces jigsaw puzzle a lovely way to spend the day with your children or sweetheart. Made by Springbok, from 100% recycled materials, the quality of the puzzle guarantees that you will like it even more. This little piece of chocolate heaven will never expire and it will not make you gain any extra pounds, no matter how much you use it. It makes the perfect jigsaw puzzle Valentine, and if you really want to know the best thing about it, we will tell you: at PuzzleWarehouse, chocolate comes cheap.